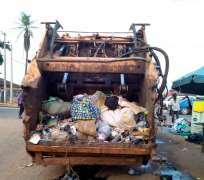 The health of members, residents and passers-by of Umuagu quarter of Asaba, the Delta State capital have been placed in danger as one of the Private Sector Participants (PSPs) engaged by the state government to collect wastes from houses has abandoned its waste collection van along the ever busy Nnebisi road by the United Bank for Africa (UBA), on the road leading to the popular Umuagu altar. The van which has been left by its operators in the last three days, is laden with waste which are harmful to the human health as dirty and oozing liquid have littered the three road junction with heavy commercial activities. Few kilometers from the van, the environment is saturated with offensive smell which has covered the area as road users and commuter covers their nostrils before passing the van. Food items such as bread, roasted corn, oranges, water melon, and ground nut among other edible foods and items are sold just by the side of the van as over 1000 persons inhales the odor on daily basis. A cross section of traders and road users told The Nigerian Voice that the odor emanating from the van is enough to cause serious sickness to them, “we have no other place we can relocate to on the immediate that is why you still find us here. This is about the third day that this van got spoilt here; the driver and others whom we saw just abandoned it to our detriment and others who pass here daily. Efforts to get the side of the Commissioner of environment, Mr John Nani, chairman of the state PSPs and local government chairman, Comrade Uche Osadebe, proved abortive at press time.